Every year after the holidays I feel like the walls are closing in on me. I have an intense need to purge, simplify, and organize. This year it was worse than ever before. Every member of the family felt the impact of me going back to work, and adding a new (messy!) member to the family. Isn't he cute? If he looks guilty, that's because he is. He doesn't allow us to vacuum or mop without barking and howling and launching himself at the cleaning equipment. Sometimes I just give up and play with his adorable ears, which leaves us with a messy house. I showed you a picture of Jasper because soon I'm going to show "before" pictures of my master closet and they aren't pretty. If you need to come back to this picture, I understand. The house was bad. It was messy and smelly and disorganized, and dusty and gross. Doesn't that sound delightful? Want to come over and hang out? I have wine. So, where to begin with Kon Mari? I heard about this buzzword/organizing method throughout 2015, and I'm always late to the party. I'm skeptical by nature, and this whole movement sounded odd, so I skipped it. When the hashtag began to regularly pop into my instagram feed, I gave in. I read the book. I have a collection of organizing books - you might consider it a hoard. It's not helpful to save a collection of dusty organizing books that promise plenty of clever storage tips, when you just end up organizing and storing everything in labeled bins and still have too much crap! This is exactly what I was struggling with! The Kon Mari method walks you through the process of letting all of the extra stuff go. If something doesn't "spark joy" then why keep it? Rather than deciding what to get rid of, choose the things you love, and let the rest go. That is the gist of it, but the book goes into great detail about the process, and she does follow a rigorous process for a reason. 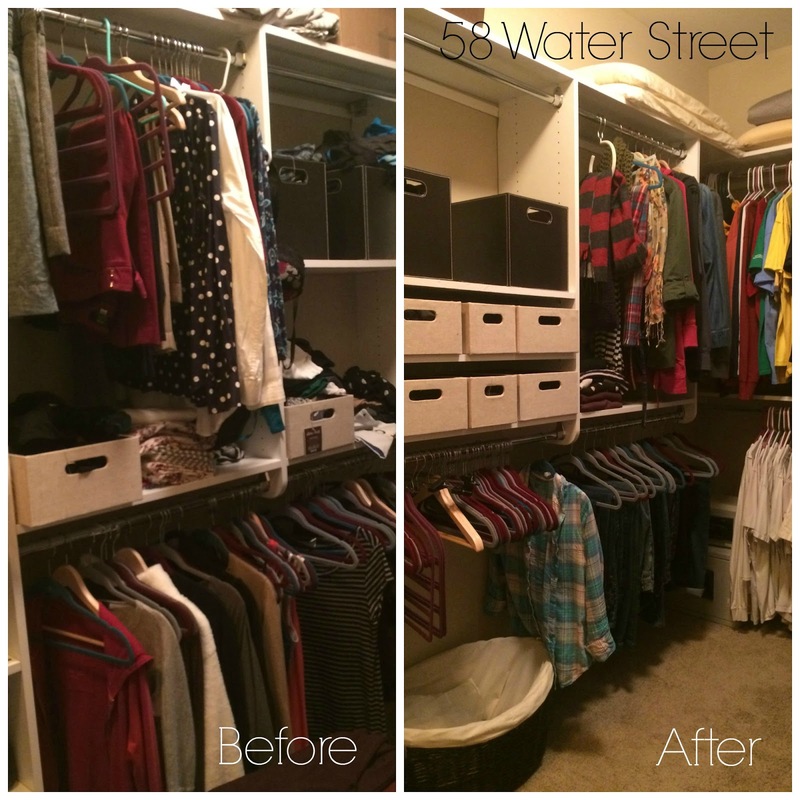 I decided to start with my side of the master closet. She suggests that everyone begin with purging clothing because it is the least sentimental of our possessions. 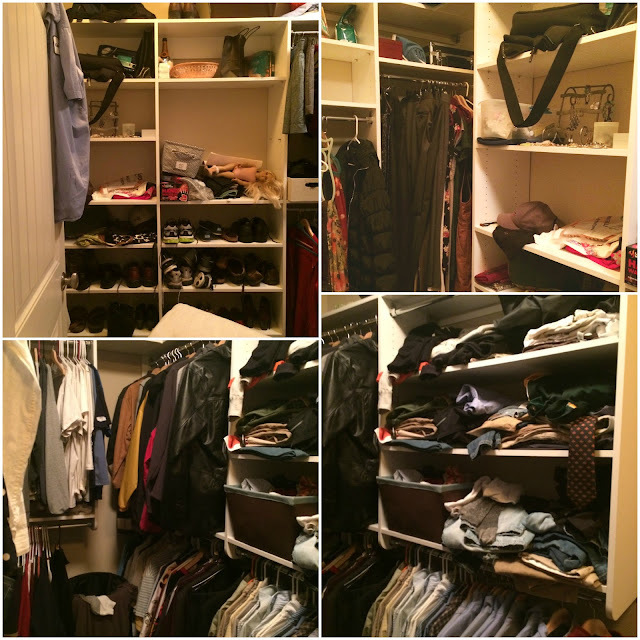 As luck would have it, the master closet was in desperate need of attention. When we moved in last August, we stored a lot of things in the closet that shouldn't have landed there, but we were still adjusting to having extra space in this house. So after a year+, it was time to reassess the space and reorganize. 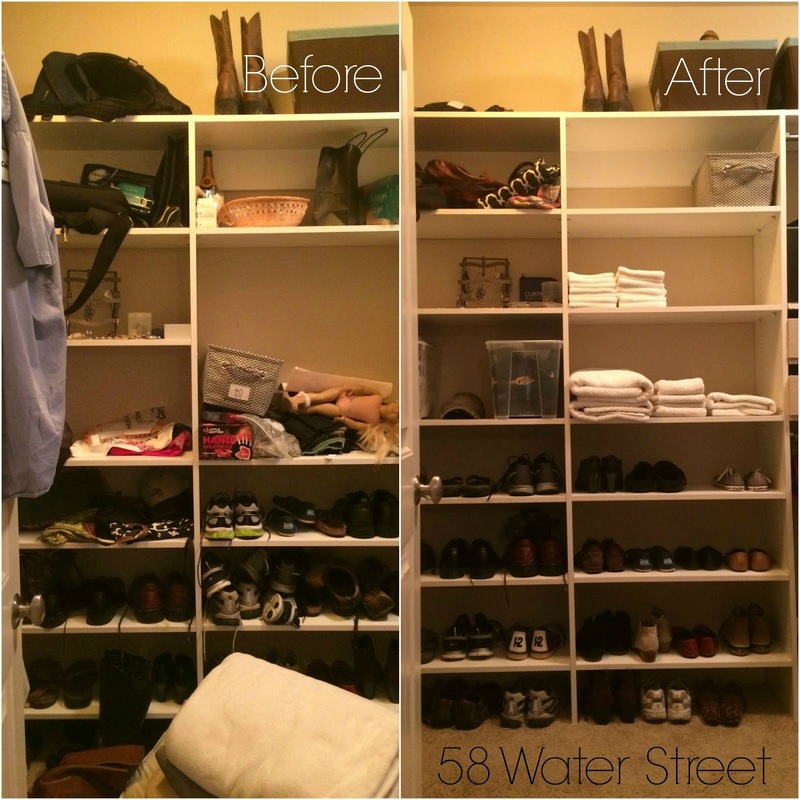 I took some "before" pictures, but this is a judgment-free zone. I know half of you will recoil in disgust, and the other half will recognize the struggle. Please note these are iPhone quality, and I'm not trying to win any photography awards with this particular post. If the general chaos didn't force you to take a deep breath, maybe the scary doll did? In case you didn't catch the doll, here's a closeup. She always gave me a start when I walked in there, but better I know where she is then find her missing, if you know what I mean. My daughter decided she is terrified of dolls (can't imagine where that idea came from?) and Julie showed up in my closet one day. This really is a theraputic process. In the end I donated three full garbage bags of clothing, and tossed a bag of clothing that was ready to be put to rest. I did adjust a few details to suit our needs. According to Kon Mari, we're supposed to fold everything and put it in drawers, but we don't have a dresser. We keep everything in the closet. So I bought several small bins to store my socks, tank tops, and unmentionables. I am skeptical about rolling up my shirts, but I'm giving it a try, and it makes more sense to do that than stack them in piles where you can't see them. I'm in "wait and see" mode on that. I'll keep the empty hangers just in case. Look at all of that empty space! I discovered that I have a ton of jeans. These are also supposed to be folded, but I have this closet space, it makes sense to use it. 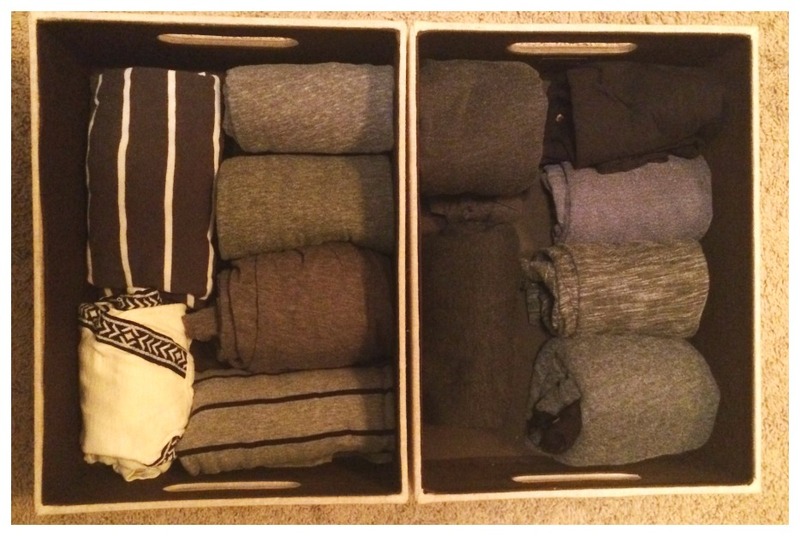 I also discovered that I have an excess of gray shirts. 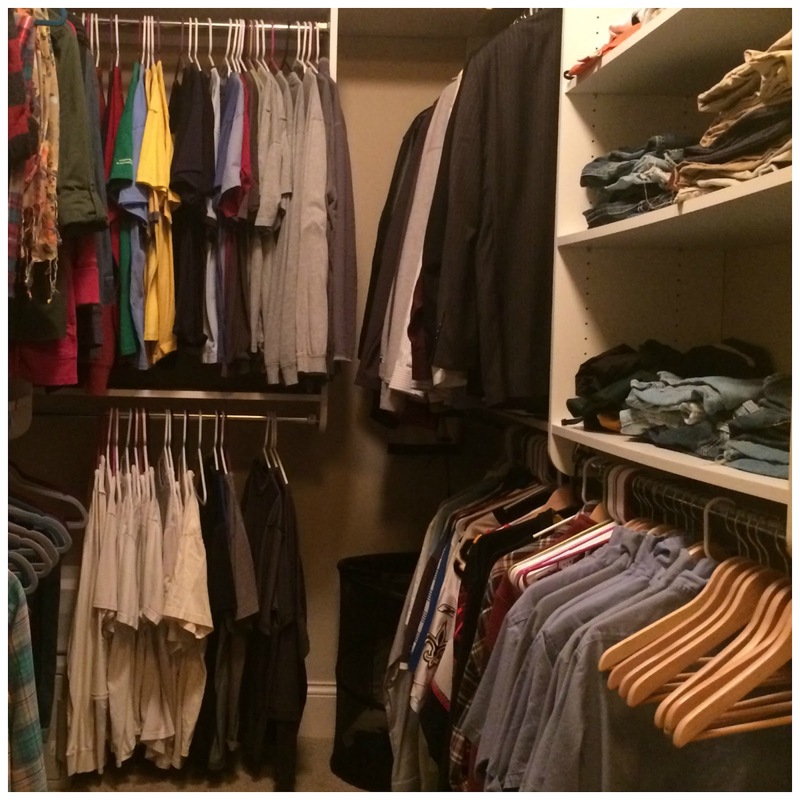 When I showed Jason my organized closet space, something magical happened. Jason disappeared into the closet for several hours, and eventually emerged with three huge garbage bags. His side of the closet looks amazing too. We both got rid of so much clothing that we don't need or wear anymore. 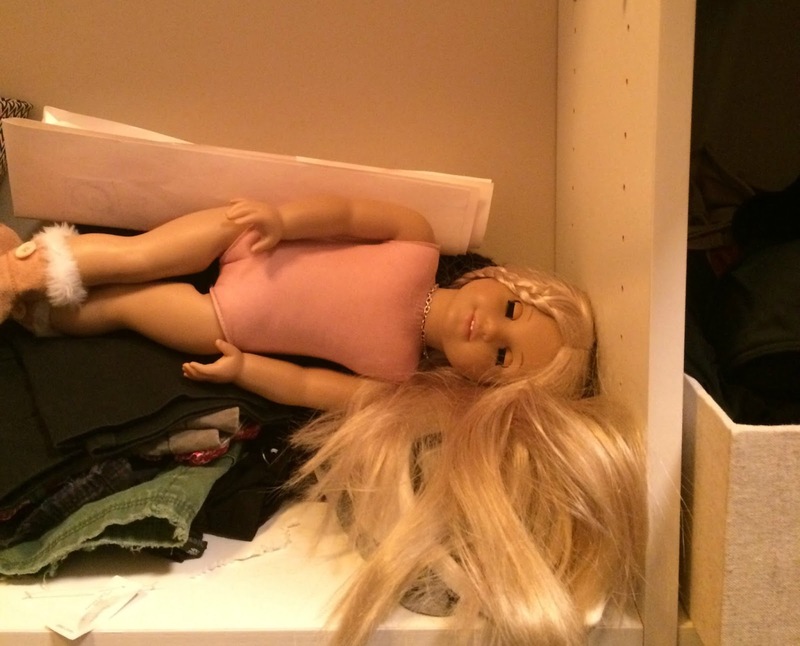 The closet feels clean, organized, and useful, rather than a dumping ground for everything, including scary dolls. I'm teaming up with a few other bloggers who are starting on their own organizing journeys. Take a moment to check out their projects. We will post updates every month. I haven't decided which space I'll tackle for February! If you're interested in reading the book and joining us, you can find it here. Do you remember what this vintage beauty looked like when I brought him home last week?